I’d never read anything by Neil Gaiman before; “Not my thing”, I’d decided. Then I watched the film adaptation of Startdust and thought maybe I’d give it a try after all. But I never did. 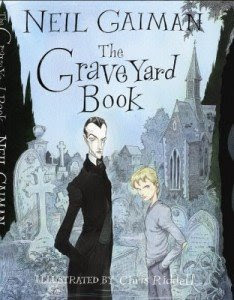 And then all the publicity for The Graveyard Book started appearing … and talk about judging a book by its cover. As a school librarian I should be ashamed to admit it but I decided to read the book purely because of the magnificent cover by Chris Riddell! I probably wouldn’t have bothered if only the David McKean cover had been available. And what a mistake that would have been! Because WOW, what a book! Bod is only a toddler when his whole family is murdered by the Man Jack; narrowly escaping, he takes refuge in a nearby graveyard. After many discussions, the ghostly inhabitants decide to look after him and he is adopted by Mr and Mrs Owens. Under the watchful eye of his guardian Silas, Bod grows up as a living boy in a dead man’s world, with all the abilities of a ghost. But the Man Jack cannot rest until he has finished the job and is still on the lookout for Bod. This is a fantastic fantasy book and a great coming-of-age book. There is lots of action, plenty of twists (some of them I did not see coming!) and enough gory creatures to keep fans of this genre entertained. But most of all, it is an amazing love story. Gaiman writes so well you forget that Bod’s parents are in fact ghosts and his guardian a vampire; what you take away from this story is the sheer feeling of devotion for a child (the last chapter was heart-breaking for me but I think that’s just because I am a mum and the thought of “letting go” of your child is quite hard!). A brilliant book, defintely one of my favourites of the year! I like this cover a little better than the US one. And if you are the one who wanted a vampire book for a 30 year old guy, Darren Shan’s Cirque du Freak series has much to recommend it, even to adults. I just finished “The Graveyard Book” for the first time a couple of days ago. It is truly wonderful My son, age 12, (I’m 52), looked at me funny when I checked out a “Juvenile Fiction” book from the library… But if This book is a fair example of the treasures hidden behind the “J divide,” I’ll be browsing that section a lot more in the future!